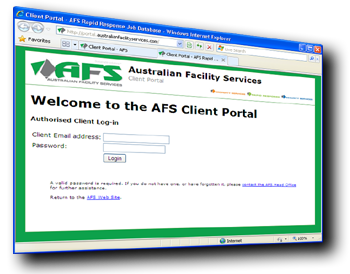 The AFS Client Portal provides our valued clients with real-time access to job information (for Rapid Response) and QA Reports (for Cleaning & Maintenance). A password unique to your organisation is required. For more information or to request access, please Contact AFS. Access the portal at portal.australianfacilityservices.com.